Going In to tomorrow’s home game against Army, the 2018 University of Buffalo Football team is undefeated with a 4-0 record. 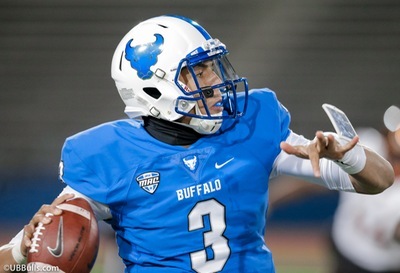 Most of the time being 4-0 means a team is pretty good, is that the case with UB this year? Looking at their schedule, UB, who had a number of key returning players this year, has not played a very difficult opponent and in fairness they should be 4 – 0. Delaware State was an FCS level team and has yet to win a game this year. Temple has been a solid American Athletic Conference team the last few years and are 2-2 on the season. One of Temple’s wins was at Maryland and so that win is a solid win for UB. Eastern Michigan is also 2-2 with one of their wins coming at Purdue, so again it is a solid win. The Bulls blew out Rutgers last week but Rutgers may be the worst team in the Big Ten this year so it was expected. This week the Bulls host 2-2 Army and the Black Knights may be the best team UB has faced so far this year. Last week Army went into Oklahoma as a heavy underdog and gave the Sooners all they could handle before losing 28 – 21 in OT. Like all military teams, they are very well coached, tough, physical and disciplined. If you beat Army, you deserve the win because of how hard they play. If UB beats Army then I will say that UB is a very good team and should be the favorite to win the MAC this year. I’ve been scouting MAC teams since I became a full time NFL scout in the early 1980’s. I have seen that League grow and one thing I know is that if a team in the MAC has a strong quarterback and some solid NFL prospects (meaning draftable prospects) then they should win the Conference. UB has just that. In Tyree Jackson, they have not only the best quarterback in the conference but a player who could very well be a premium round draft choice in the NFL. In wide receiver Anthony Johnson they have another player who will go in the premium rounds. The only question in Johnson is how fast he will run. If he runs a sub 4.50 he could go as high as the first round. Being that wide receiver is a stop watch driven position, timed speed counts a lot. Jackson and Johnson aren’t the only NFL prospects on this team. Center James O’Hagen is also a solid prospect who has been getting a close look by NFL scouts. On the defensive side, there are two other prospects and by the end of the season they are two players who could be early day three type players. Defensive end Chuck Harris has that ‘tweener type size that means he is getting looked at by both 3-4 teams as an outside linebacker and 4-3 clubs as a defensive and. Players who can rush the passer are looked at very closely by scouts. In four games, Harris has 5.0 sacks. That is very good production. Linebacker Khalil Hodge has what all NFL clubs look for in a linebacker, speed, instincts and athleticism. He already has 47 tackles on the year and in the last three games he has hit double digit tackles each game. He can play! So to answer my original question…how good is UB? Very good! I can see them winning 10 games this year and that is no small accomplishment.